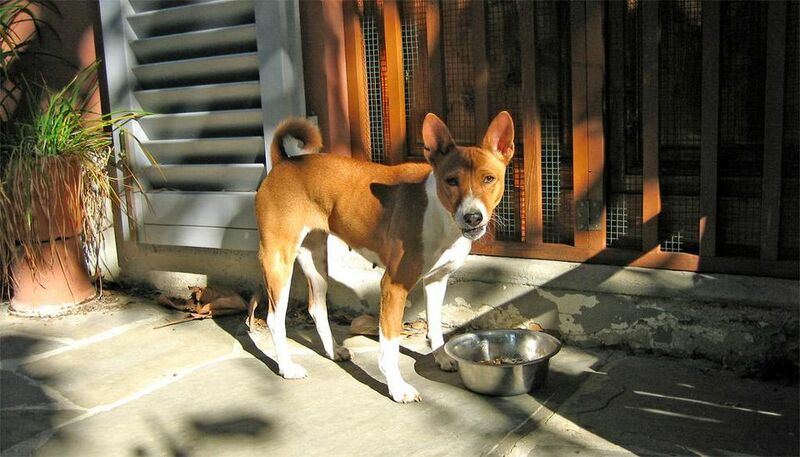 The basenji is among the most distinct of all dog breeds. This small, elegant dog is probably best known for its lack of barking. However, the breed will sometimes whine and make noises that resemble yodeling. The basenji is a muscular dog but is also very lean and agile. This breed is quite intelligent, with a fine character and curious nature, but can be hard to train to respond to commands. Many people consider the basenji to be a cat-like dog. Colors: Smooth, short coat in chestnut red, black, brindle, or tri-color (black and red); all have white feet, chest and tail tip; may have white legs, blaze, and collar. The basenji has been identified by DNA studies to be one of the basal breeds of domestic dogs, tracing back to their divergence from the gray wolf. Basenjis were known all the way back to ancient Egypt, where dogs with all of the traits of the basenji are seen carved into stone on the tombs of the pharaohs. The breed was further developed as a highly skilled hunting dog in central Africa, where it became known as the Congo dog. The name of basenji comes from languages of the Congo and means village dog. Basenjis show some differences from modern dog breeds, one of which is that females go into heat only once per year. Basenjis were brought to Europe and the United States during the early to mid-20th century where they were further developed and refined. The breed was recognized by the American Kennel Club (AKC) in 1943. To this day, the Basenji remains a skilled hunter and worker with an affectionate and loyal demeanor. The basenji's smooth, short coat requires very little grooming. This breed actually cleans itself, kind of like a cat, but you can assist with brushing once a week. They rarely need a bath. The typical "dog odor" is not usually present in this breed and the fine hair isn't very noticeable when it is shed. Additionally, the basenji may be considered hypoallergenic, as it barely sheds at all. However, allergens are present in a dog's dander and saliva, so your reaction will depend on how sensitive you are. Be sure to spend time around basenjis to see how they may affect you before adopting one. You should trim your dog's nails to prevent breakage every week or two. Help your dog maintain good oral health by brushing his teeth regularly to prevent problems with his gums and teeth. Basenjis are known to be very loyal, affectionate, alert and active. They are best suited to homes where they can get adequate exercise, plenty of attention, and proper obedience training. The basenji has an independent personality and sometimes has a mischievous nature and/or rebellious streak. Opinions on their intelligence differ as they may perfectly well understand commands, but choose not to follow them. Basenjis are sighthounds and so they will pursue anything they see moving. This presents a challenge for keeping them in a yard, as they are adept at climbing over fences (no matter how tall) and escaping. You can bet that an underground electronic fence won't stop them. As a watchdog, they will alert you to any passersby although they will do it with their own forms of vocalization rather than bark. Socialization is a must, especially if the dog is to be around children or other pets (particularly the smaller ones). They will usually be good around other dogs, but they will chase cats and small rodents who they don't recognize as part of their family. Basenjis are usually reserved around new people, but they can warm up to repeat visitors. They are best for families with older children who can interact with them appropriately rather than young children who may not know the right way to treat a high-energy dog. You should feed your basenji two meals a day of up to a half cup of dry dog food for each meal. Your dog's needs will depend on its size, activity level, age, and other factors. It's good to provide two measured meals rather than having food out all day for free feeding. Monitor your dog's weight to ensure he isn't packing on any extra pounds as that will shorten his lifespan and predispose him to other conditions. Discuss your dog's nutritional needs with your veterinarian to get advice on feeding to keep him healthy. It is important to research and become educated about the individual features of different types of dogs. Because the basenji is unique, it may or may not be the right fit for your home. Try to locate basenji breeders and owners in your area so you can spend some time with the breed first. Also, consider searching for a basenji rescue group to adopt one. There are many different dog breeds to explore to find the right one to bring home.